Everything about Steve and Jeanette is about love. And kindness, graciousness and generosity. Some couples make my day. This couple helped to make my month of May! I worked with Steve and Jeanette (and their beloved dog, Hot Dog Rodney!) to craft and create a personalized ceremony that truly celebrated their loving relationship and family and friends. On the afternoon of May 19th at the Sanctuary at Admiral in West Seattle, it was such a pleasure and joy for me to join Steve and Jeanette for a ceremony that truly was an uplifting celebration. 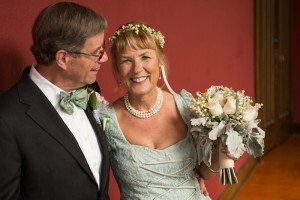 Most of all, this ceremony celebrated Steve and Jeanette – their individual paths, courtship and their intentions for their shared life as husband and wife. Steve and Jeanette – I feel so incredibly grateful to have shared in your wedding day. Thank you for giving me the opportunity to be hugely creative and to truly share your love, joy and elation with your tribe. And I was so touched with my boxed lunch “to go” – thank you!